I didn't want to do this post until I gave this to my sister. I made this little guy for my new little niece or nephew, and....... it's a girl. Her name is Summer and she was born on the 2/8/12, a week before Ruby is 2. She is just so cute and lovely and I really want another one now. I made this little guy a few weeks ago and he has been waiting, well everyone was really. She was 11 days late, Ruby was 12 days late, we incubate well I think. Now I didn't follow a pattern as I couldn't find one I liked. I kind of increased and decreased and I am really happy with how he turned out. Actually I would say this has been one of my favourite projects and everyone has loved him. I might have to make one for myself now. They have a very special person to make happy. So clever! And soooo cute! He's very cute - I can't believe you didn't have a pattern! Love the rattle too, they make quite a pair. Hey Emma, love your giraffe.....too cute and the rattle makes a great mate for him. The Giraffe is adorable. I imagine a boy or girl baby will love him. Oh so cute. A gift to treasure. That Giraffe is the cutest ever! And how cool did it turn out without a pattern! Your niece has a very special Aunty!!! They are beautiful, well done! My friend came across your giraffe and fell in love with it. She's asked me to make one for her to give to her oldest daughter, who is expecting their first child. Is there any way I could sweet talk you into emailing me your pattern? Even if it's just a rough one - I'm an experienced crocheter. Just don't have a whole lot of time to design one for myself (will, if I have to). I promise not to sell it or claim it as my own. She just really loves your version! I love this idea!!! I would love a rough pattern as well!!! Plzzzz!! I am planning on doing a pattern, I am just suffering major morning sickness at the moment, I am hoping in the new year to get it done. I would love this pattern too. It is really awesome, great work!! I can't wait to get the pattern! thank you for that! Could you please tell me how big (approximately) the giraffe is going to be, once its finished? Thanks so much! I love this Giraffe! Can I purchase or get a copy of the pattern? Thank You for considering my request. I love it!! Where can I get a pattern for this? 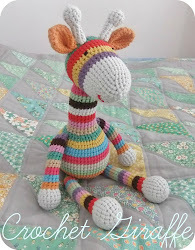 I've been looking all over the place for a giraffe pattern! Please help a crocheter out! How tall was this giraffe? Dear Emma, I love your works, everyone is so great. No matter the material or the color is such amazing. May I ask you what the brand（model) is you use in "Giraffe" and "Granny square blanket"? I will never make any work from your web site in commercial purposes. Thank you so much, and answer me to my email: jclin9083@gmail.com please.